Google Analytics contains several special features for building queries. For information on setting up a Google Analytics connection, see Connecting to Google Analytics. A Google Analytics connection includes default calculated metrics such as Bounces, Time on page, and Session duration. 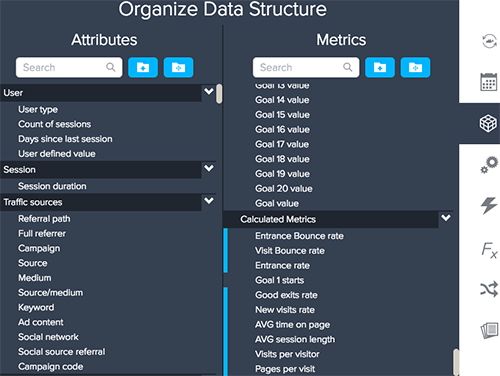 For more information about Google Analytics attributes and metrics, see Google Analytics' Dimensions and metrics explorer list. 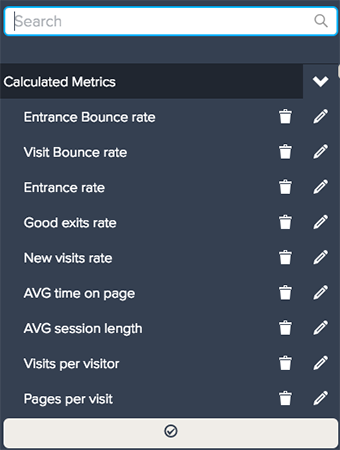 Click the + icon on the Metrics section of the frame. Select a metric from the Calculated metrics category at the bottom of the panel. You can also view all default calculated metrics in the Organize data structure menu. Along with these calculated metrics, BIME has added the calculated attribute Date ISO. Date ISO is an important attribute for joining Google Analytics with connections from other sources. The Google Analytics date element is a number string, but sources such as RDBMS, files, or Salesforce will not recognize the format. Date ISO enables you to create a text version of the Google Analytics date to use as a join key. Google Analytics also contains a custom menu icon called Date period. Date period enables you to easily change your date range without using the range date functionality. You can open the Date period menu by clicking the icon on the right panel. There are two types of Date period options, Simple and Advanced. For the Simple option, you can select a date range from a list of named periods such as today, yesterday, this week, last week, etc. 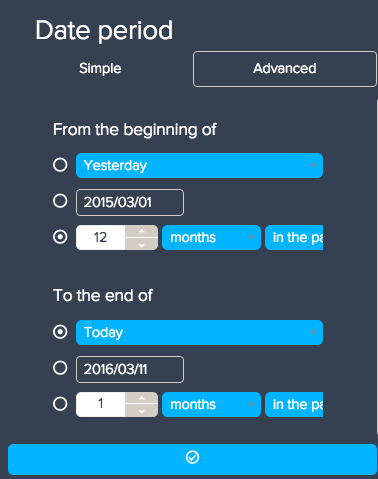 For the Advanced option, you can select separate beginning and end dates. For each beginning and end date, you can select from a list of named periods, enter in a calendar date, view all history, or select a rolling period. In a rolling period, you can select options like seven days in the past or a year in the future. A segment is a subset of your data that is filtered before you connect to BIME. Segments are useful for attributes with a large number of values such as keywords or Page Paths. You can create segments in your Google Analytics' account before connecting with BIME. There are default segments available such as Direct Traffic, Mobile Traffic, and New Visitors. You can add segments individually by placing them on Filters, or you can compare different segments with the powerful All segments attribute. 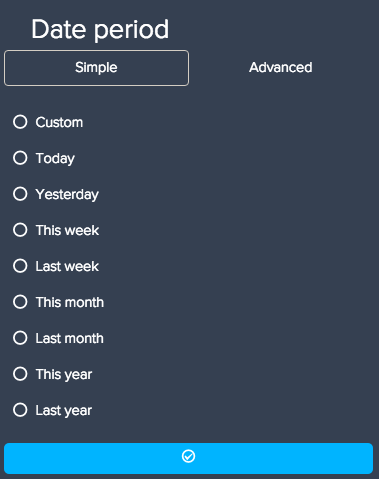 With All Segments, you can compare all of your segments against each other or select specific segments as values. You can also create dynamic segments to apply to your data using the BIME calculation engine. When you launch the Dynamic Segment editor in the Calculation engine menu, you will be able to define a dynamic segment. A new dynamic segment will appear in the Segments dimension and in the All Segments list. Google Analytics API syntax is used here. The system will give you tips and examples on how to set up your segment in the box on the right. You can find more information in the Google Analytics API reference guide. You can use dynamic segments as filters or as GA segments. The main difference is that segments are session-based while filters are not. An example of a syntax would be: ga:pagePath=@blog. If you use Page Views and the above syntax as a segment, it will return the number of pages viewed in all sessions that included at least one page view of a blog page. This means that it can include more pages than ones that actually satisfy the condition 'contains blog'. If used as a filter, it will return only the views for pages satisfying the condition 'contains blog'. Note: Any white space you would like to include should be encoded with %2520. For example, if you wanted to find keywords containing 'bime analytics', the code would be =@bime%2520analytics.